How acquired: purchased for $25 at a farm auction, spent over $50 in gas getting her home. I considered this a steal! Description: Don't let the rust fool you, this 50's/60's model full-ton truck-frame-turned-hay-wagon is a stout timber mover. Best Feature: Factory 8 lug wheels and tires that hold air for weeks on end. "Shocks... pegs... lucky!" Worst Feature: The steering linkage leaves much to be desired. She swerved violently and repeatedly into oncoming lanes of traffic when I tried pulling her back from the farm auction at anything faster than 5 mph (at night, with flashlights taped on for tail lights). Under the theory of "best to act first and ask forgiveness later", I abandoned her at a gas station 45 miles from home (3 miles from the auction), in spite of the too-busy-to-stop-me cashier staring in disbelief as I unhitched her on his tarmac. I returned the next day with a car-trailer and come-a-long, and brought her back home where she happily hauls and stores at least 10,000 pounds of timbers. How acquired: Came with the farm that I bought from my father-in-law. Description: With the original wooden bed rotted off, this puppy had long been retired from hay service. We added four timbers to the chassis and she rolls again. Best Feature: The transverse pegged timber bed serves as mobile saw horses for really long timbers. Here you see a timber receiving a last minute mortise on site while being supported safely by the green machine. How acquired: Borrowed from a brother-in-law who took it in on trade. Description: Your basic hay-wagon with the bed rotted off, sporting a bold yet stylish yellow frame that matches the rims on my tractor. Best Feature: Cool low profile tires on front (from a Chevy Fiero?) and big Herman Munster tires on the rear help keep our timbers from sliding off the back of the wagon while going up the steep road to the house site. Worst Feature: Tires go flat quickly when left in barn with over 10,000 pounds of 26 foot long timbers stacked on it. How acquired: Bought many years ago for hauling atv's. Description: A car hauler that led an easy life until coming to the farm - now depreciating quickly. Hauled eight 1200lb rolls of hay at a time before going into timber service. Best Feature: In spite of a recent $99 citation in Ohio to the contrary (some nonsense about tailights, turn signals and expired license), this trailer is road-worthy and has working brakes. Makes trips to Lowes after being retired from timber duty. Here you see her hauling standing seam metal. Worst Feature: Fenders always getting in the way - requires 8" of donnage to load and unload with forks. Was speared through the fenders with a hay spear (by alcholic farm hand, no longer employed here) before going into timber service. Wrinkled/squashed fenders tend to rub tires when hauling heavy loads. How acquired: Bought from a friend for $300. In an earlier life, it hauled equipment for a gospel band. Then, it became the inspiration for its next owner, "the spirit man," who hauled his racing go cart equipment in it. Description: Although it has never hauled a timber, this is our most revered wagon and I would be remiss for not including it in this lineup. It holds our persuaders, chisels, slicks, mallets, and other assorted tools. Best Feature: It has a roof for keeping tools dry, and it can be moved around by hand if it is ever in the way. Worst Feature: If you step into it while it's unhitched and unchalked, it will pop a wheely, dumping you and the tools out the back door. If, perhaps through divine intervention, you somehow manage to circumvent the wheely by shifting your weight forward, it will roll downhill with you in it. I've at least one more hay wagon to add to this lineup, but I can't find a picture of it on the hard drive. No fear, that particular wagon still has our porch timbers on it, so I'm sure it will be back in the picture within a year! We notched and stacked hundreds of timbers for over one year before assembling our frame. Occasionally, self-doubt would creep in and I would wonder if we were ever going to get the frame to fit together. 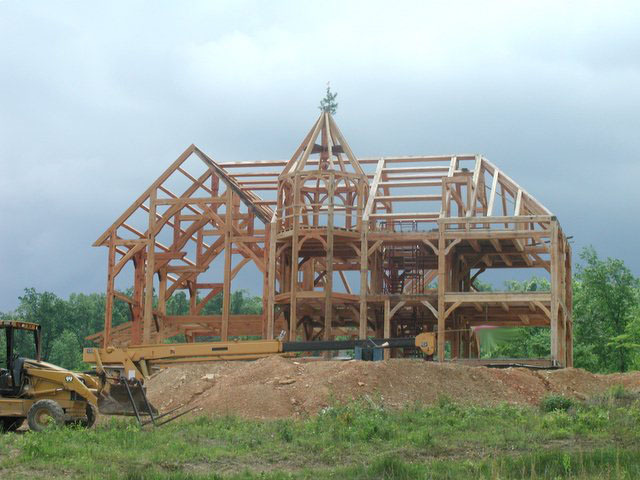 Just how many stinking timbers were sitting in the barns, with grievous errors in the joinery... waiting to rear their ugly heads when it came time to raise the frame? The stick-frame carpenter who took the timberframe course with me, and eventually notched more timbers than me (and drank a whole lot more beer than me... every day... while working) claimed that he was going to be on vacation some where far away when I tried to put the frame together. That did not instill much comfort. "Oh well," I would tell myself, "I can always cut the tenons off and put it together with lag bolts if the wooden joinery thing doesn't work out." You must always have a plan B.
Fortunately, there were not many mistakes lurking in that pile of timbers, but it would dishonest not to admit to at least a few. In fact, there was on average, one small mistake in every bent of our house. As we progressed from bent to bent, I found comfort when we located the error in each bent - surely there couldn't be more than one mistake in a bent! All of the mistakes were minor, none required scrapping any of the timbers, and any visitor in our house today would have a very hard time locating any of the faux paus. One common mistake (I think it happened 4 or 5 times in the frame) was the "misplaced brace mortise mistake." My drawings, I decided, were to blame for this mistake. You see, I would dimension two sides of the mortise with respect to one edge and one end of the timber. Then I would call out the dimensions of the mortise. It was very easy during "layout" (the process copying the drawings to the timbers) to draw the mortise on the wrong side of the dimensioned lines. In fact, the mortise in the picture above was cut on the wrong side of both lines! Fix #2., sometimes used in conjunction with or as an alternative to fix #1 was to make a custom brace with an offset tenon. That's what's shown in this picture. As a final note, make sure you know where all of your mistakes are if you're paying to rent a crane. I paid for my crane by the gallon (I own it, it is old, it leaks), so fumbling to fix these mistakes didn't cost as much as it could have. Drawboring (aka as drawpinning) is the technique of intentionally offsetting the peg holes of a pair of mortise and tenons to be joined. When a tapered peg is driven into the hole, the peg will try to align the two holes and in the process, draw the joint together very tightly. As the wood seasons and shrinks with time (remember most imberframes are assembled with green lumber), the bowed peg will work as a spring to keep the joint tight. The picture to the left (oak beam, ash brace) illustrates the intentional misalignment that I'm talking about. Because it takes more time, precision, and patience (all of which I find myself lacking) to create a drawbored joint, I only used this technique on the braces for my house (there are approximately 150 braces in my house, each with 2 pegs, so this was still a lot of work). The misalignment should be about 1/16th to 1/8th of an inch for hardwoods (I've read you can almost double that for softwoods). In reality, if you aim for 1/16th misalignment, you might find that you've achieved 1/8th misalignment, or no misalignment at all. Occasionally, I created holes that were off by as much as 1/4th" of an inch. It was nearly impossible to drive 1" pegs through these holes, so some of these got re-drilled and were therefore not drawbored. It takes a lot of faith in your joinery to use drawboring because once joints are assembled in this fashion, there's not a lot of room for adjustment if you find your frame out-of-square. However, I can report that when you "get it right," drawboring really works. It's an awesome thing to pound on a peg and watch two pieces of wood spontaneously assemble themselves tighter than any mechanical means could have persuaded them together. By the way, the typical alternative (shortcut) to drawboring is to temporarily assemble your undrilled pieces of wood as tightly as possible (using come-a-longs, ratchet straps, pry-bars, etc. ), check your assembly for squareness, and then to drill the assemble in place. Then you drive the peg and remove the ratchet straps. The joints are tight, but they can't possibly stay as tight as drawbored joints will. Still on the hunt for more hardwood flooring, or a millwork company able to mill our own boards into flooring, my wife and I scheduled a visit to a local flooring factory. With a throughput of 50,000 square feet of flooring per shift, and 99.99% of sales to commercial clients, we didn't think this company would be able to make us any bargains, or much less, be willing to mess with milling our boards. But they were local, so it was worth a shot. We were pleasantly surprised to walk into the deal of a lifetime. In a dark corner of their factory were several stacks of over-runs from custom orders for big clients. The factory just wanted these "little" stacks out of their way. 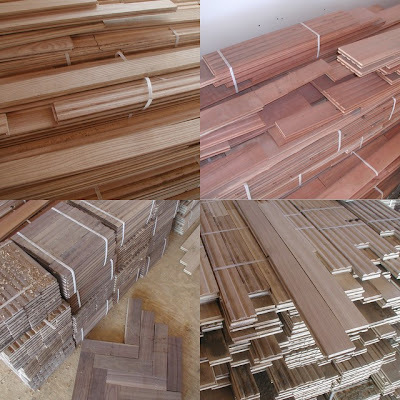 To make a long story short, we were able to buy assorted ash, hickory, cherry, walnut, and quartersawn white oak for cheaper than the yellow poplar flooring I had found a few weeks befo re. In fact, the price was even cheaper than anyone would charge to mill my boards! Ash and hickory in strips 2 1/4" wide (and variously stamped "select and btr. ", "no. 1", and "rift & qtr") made up the bulk of what I brought home. From what I've gleened from the internet, this is perfect flooring for placing over radiant heat floors. Narrow boards mean more boards per square feet, which means more joints to spread out the seasonal expansion and contraction in the boards (radiant heating can exacerbate this seasonal variance). The narrow strips are also less likely to cup I suppose. Finally, the quartersawn boards will have less expansion and contraction than plain sawn boards. Score! I wasn't able to sort through (or even really look at) the flooring before I agreed to buy it, but I did notice from looking at the ends of the pallets that the 2 1/4", 3" and 5" wide cherry boards had no bevel, whereas the 4" cherry boards did have a bevel. No problem - all of the 4" cherry boards will go in one room by themselves. The walnut and white oak boards are milled for a herringbone style installation (they all measure 3"x12" with t&g on the ends). This will slow down installation, but make for some really neat floors. In fact, we're thinking of doing a checkerboard pattern in one of our son's rooms, by installing the boards parquet style instead of herringbone style and alternating between white oak and walnut. He's taken a keen interest in chess, and could even play a game on the floor... if he keeps it clean. The only downside to all of this flooring (as opposed to the long 6" poplar boards or oak and ash boards that I would have milled from my own wood) is that it is not suited for nailing directly to floor joists. My scheme of building a house without plywood subfloor has now evaporated. The plan has morphed, so that now the entire house will have a subfloor and we have been busy as beavers installing subfloor everywhere (except where we already installed poplar, sans subfloor), and the house is now a much friendlier place to work. While I'm on the topic of subfloor... Much of my house has rough-sawn oak 3x3's for floor joists (running perpendicular to the sparsely space 6x8 timber floor joists). The problem (or trick) of using saw-mill lumber is to develop methods of dealing with the variations in thickness, as none of it has seen a thickness planer or kiln before being placed into the structure. First of all, I started at the sawmill by cutting 3x3's instead of 2x4's. That way, I have 2 chances to get the critical 3" height of the board correct at the saw mill. When we install the 3x3's, if we find a 3x3 that measures 2 3/4" by 3", we place the material so the 2 3/4" dimension does not matter. It's also important to make sure the 3x3 spans at least three timber floor joists, so that when it dries it will not bow up or down. And finally, when you go to install flooring above the 3x3's, you can shim the short ones (2 7/8"?) up with strips of roofing felt. That's an idea that I came across somewhere on the internet and I can report that it works very well. You can see subfloor glue, as well as some of these black shim strips in this last picture.